A routinely updated, animated map shows murder rates around the world. "We understand that homicide is a very good indicator about how widespread violence is, and the kind of feelings and insecurity that people are subject to," says Renata Giannini, the program officer at lgarape, the Brazilian think tank that made the map. "We wanted to draw attention to that, and provide information about it—the trends, the profiles of victims, how they're assassinated, as a first step towards doing something about this issue." To interact with the map, go here. Shocking statistics put in perspective the relative danger of Latin American compared to the globe's other continents. 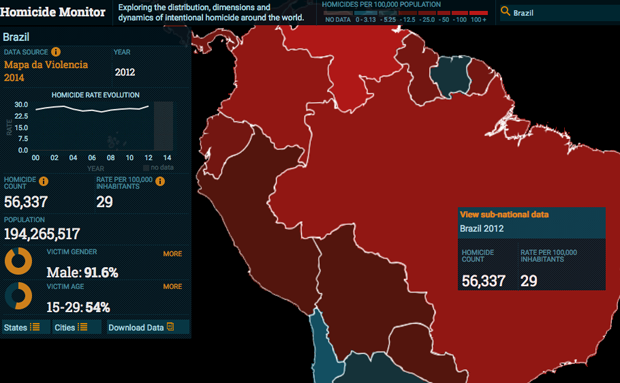 1 in 5 people murdered around the world is either a Brazilian, Colombian, or Venezuelan. And 14 of the 20 countries with the highest homicide rates are in Latin America. Most homicides are geographically concentrated, however. In Bogota, Columbia, 98% of murders happen at 2% of street addresses.